Running the City explores through new media art, our movement through the urban environment and the reconfiguring of its operations in ways that are variously liberating and disturbing. This talks series features Australian and international artists, who address the psycho-physical dynamics of our inhabitation and utilisation of city spaces. Volker Kuchelmeister discusses his work City Jam that will be exhibited as part of the Running the City exhibition. Kulchelmeister will discuss City Jam and the immersive qualities of the video and technical aspects employed to create a panoramic experience. City Jam is an interactive, expanded cinema installation that reconfigures the gallery space into a vertiginous, theme park environment. The work takes the viewer on an immersive ride through some of Sydney’s iconic landmarks, such as Bondi Beach, the CBD and Sydney Opera House. Accompanied by a fast-paced sound track form Australian 80s indie-punk band XL Capris, the semi-circular projected imagery is exposed to glitches triggered by the presence of spectators in the space. Volker Kuchelmeister is known for his research and practice in immersive data visualisation and expanded cinema. The shifting transience of urban and natural landscapes is repeatedly the backdrop for his 3D and stereoscopic videos. The artist incorporates real-time data recordings into his videos to determine the influences of time. He has been co-inventor of multiple new media technologies, including iDome hemispherical projection environment and Spherecam 360˚ capture system. Kuchelmeister’s Double District was exhibited as part of the Shanghai eArts Festival in 2008. 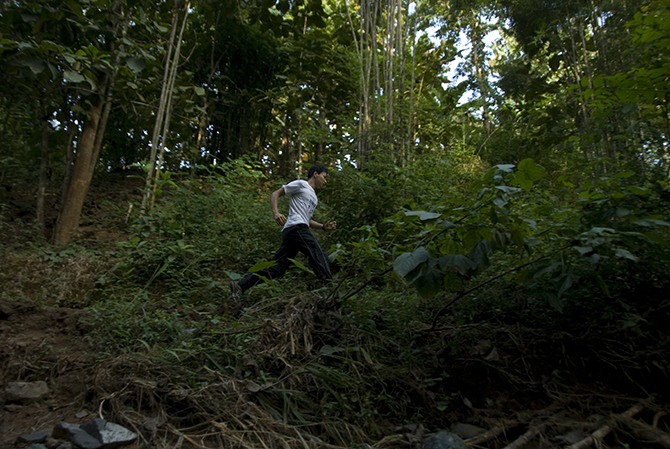 Having clocked up 3135.7 km to date in runs in sixteen locations around the world, Jun Nguyen-Hatsushiba speaks about the premise and importance behind his ongoing body of work, Breathing is Free: 12,756.3 (commenced 2007). This ongoing video series by one of the world’s leading contemporary video artists will be shown in the Running the City exhibition. It follows the artist as he runs through cities of the world, including Tokyo, Geneva, Singapore, Chicago and Canberra. Running the City will present all the artist’s runs so far in a multimedia installation across several gallery spaces. Born in Japan, raised in the United States and currently residing in Vietnam, Jun Nguyen-Hatsushiba is a truly global artist. Concerned with Vietnamese history and national identity, Nguyen-Hatsushiba incorporates drawing, video, installation and photography to explore the migratory movements and worldwide displacement and interchange of refugees. His work repeatedly references the impact of the Vietnam War, both locally, for the Vietnamese people and worldwide. Seen as a triggering point for significant change, Nguyen-Hatsuhiba identifies the social and political consequences of this significant event in Vietnam. His work his been included in the 2011 Yokohama Triennial and 2009 Asia Pacific Triennial. 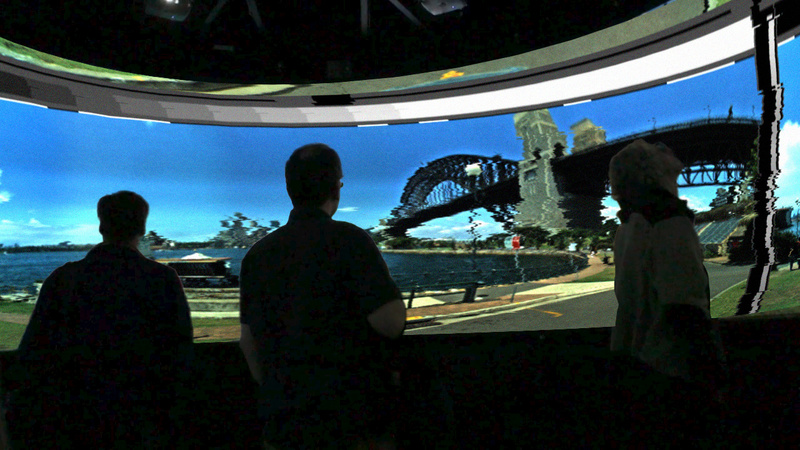 Professor Richard Goodwin discusses his ARC funded research with Russell Lowe, which has modelled much of Sydney’s CBD in the Crysis Gaming engine. This work has been done in order to prove his theories about urban Porosity, Parasitic Architecture as a sustainable design strategy for the future and as a way of satisfying the needs of security services for creating computer modelling which enables scenario planning for future catastrophes in the city. Richard Goodwin is an artist and architect who combines the disciplines in experimental propositions and projects. Combining performance, installation and architecture, Goodwin?s work is politically and socially active. Often working in public space, he creates works that are site responsive, explorative and sometimes confronting. In his recent Porosity Studio projects, Goodwin utilises the city like a laboratory, testing ideas and mapping movements and boundaries. The recipient of many awards and accolades, in 2004 Goodwin won the Helen Lempriere Award for Sculpture and in 2012 his Porosity project was featured in Australia?s presentation at the Venice Biennale of Architecture. 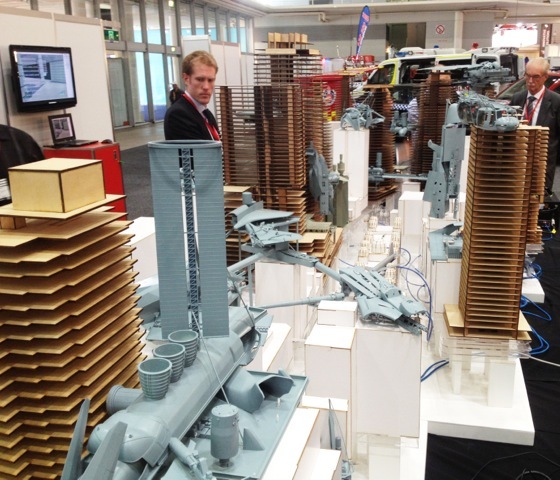 Russell Lowe is a senior Lecturer at UNSW, Faculty of the Built Environment. Lowe has pioneered the teaching and modelling of architecture within gaming engines and exhibits computer aided film animations internationally. In 2009 he joined Goodwin to further the Porosity Studio’s research into cities in real time animations.